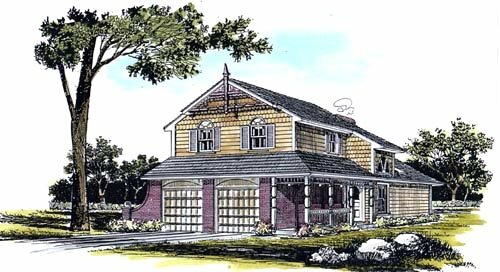 House Plan #5175 - Even the modern touch of the two-car garage fits in with the motif of this delicately ornamented Victorian. House Design # 5175 has a living room designed for use as a "great room," a dining room, kitchen with dinette, three bedrooms, two baths and a foyer, totaling 1,726 square feet of living space. There is a two-car garage, laundry room, lavatory, and full basement. Sliding glass doors lead from the living room to a rear terrace. There is also a country porch. The overall dimensions of 52 feet, 6 inches by 28 feet, 6 inches include the garage.